The classification of textual documents has been the subject of many studies. Technologies like the Web and numerical libraries facilitated the exponential growth of available documentation. 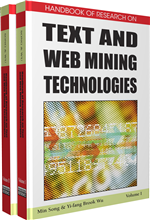 The classification of textual documents is very important since it allows the users to effectively and quickly fly over and understand better the contents of large corpora. Most classification approaches use the supervised method of training, more suitable with small corpora and when human experts are available to generate the best classes of data for the training phase, which is not always feasible. The unsupervised classification or “clustering” methods make emerge latent (hidden) classes automatically with minimum human intervention, There are many, and the SOM (self Organized Maps) by Kohonen is one of the algorithms for unsupervised classification that gather a certain number of similar objects in groups without a priori knowledge. This chapter introduces the concept of unsupervised classification of textual documents and proposes an experiment with a conceptual approach for the representation of texts and the method of Kohonen for clustering. To implement any method on textual document we initially need to represent the documents (Sebastiani, 2002), because there is currently no method of learning able to directly process unstructured data (texts). In a second time it is necessary to choose a similarity measurement, and lastly to choose a clustering algorithm which will develop starting from the chosen descriptors and metric. Reuters-21578: (corpus) Is a set of financial dispatches emitted during the year 1987 by the Reuters agency in the English language and available free on the Web. This corpus is an update of the Reuters-22173 corpus. This update was carried out in 1996. The texts of this corpus have a journalistic style. The characteristic of the corpus Reuters 21578 is that each document is labeled by several classes. This corpus is often used as a comparison base between the various tools for documents classification. Map: The map seeks to preserve the topological properties of the input space.